Well, I think I have just made my favourite dress EVER. I can see me making this up in hundreds of different materials and wearing it all summer long. I have made it here in very light weight fabrics. 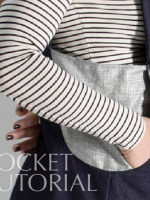 The orange centre panel is a light silky viscose, the side panel is grey marl t-shirting and the sleeve is a light polycotton in a tiny geometric grey and cream pattern. altogether more glam. I have also done the side panels in soft silk for a little luxury twist. It would work well made from any combination of jersey, light polycotton or viscose. 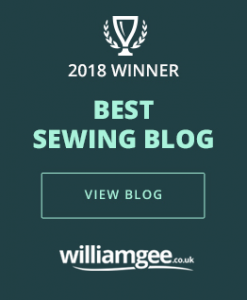 I wouldn’t use pure cotton as it just sits a little stiffly – your fabric needs to have a bit of man made fibre or silk in it to drape properly. 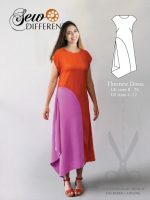 If your fabric is too stiff the dress just stands out a bit squarely. Here is another version of the Panel Dress, this time made up in a size UK 22, which is a US18. I thought I’d show it in another size just to demonstrate how well it scales up. (Thankyou Clare and Harriet for modelling – Harriet has grown up quite a bit since her modelling debut in the over-the-table-playhouse) It’s worth noting that the dress looks a bit shorter on Clare than it does on me, more of a tunic in fact, but she is over 6ft tall so you can see why. This version is made in a really fabulous geometric patterned polyester that I bought from the Knitting & Stitching Show in London. The sleeves are just some scraps of black chiffon I had and the side panels are a charcoal grey linen (left over from the St Tropez Scoop Neck). My favourite finishing touch is the hot pink satin bias binding that I used to trim the sleeves. It picks out the pink in the pattern perfectly and adds a luxurious finish. AND, for those of you who like this dress, there is also a top in really a similar style. Have a look at the Panel Tee post for more ideas. Thank you! I’ve been looking for something like this. Another one for the to do list! can you share where you got that orange fabric?. It’s the perfect color and I can’t seem to find it anywhere! Hi, just a remnant I’m afraid. Don’t know where you are based but there is a huge and fabulous warehouse, Fabworks, in West Yorkshire – have a look on my where to buy fabric page. They still had it in when I went last week. Is there any chance of seeing this dress on a woman? I really would need to see how those side panels look in real life. Thanks. I don’t have a pic of me wearing it I’m afraid. The panels can look a bit different depending on the fabric you use. Have a look at the Panel Tee to see some photos. It is essentially the same pattern but shorter. It does look very different because it’s made from a stiffer cotton fabric. The overall shape of the dress is just a rectangle with very little contouring to it. I will try to use the same fabric for the t shirt version – the one with the ruching to the side. Wow! This is gorgeous. It’s great to see something so modern and edgy. Would you mind if I used your pics on my newsletter? Would you me to reference you? And do you have any comments about the pattern or making it? Sure you can use the pictures & my name. Thank you for the kind compliments. 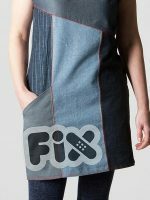 I build it by sewing the side panels from the hem base up to the shoulder seam & continued to the back base. I did top stitching for the neckline & hem base. Thank you so much for providing free patterns and clear instructions, your site is wonderful. 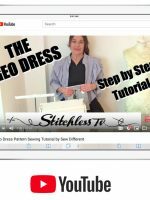 I’m only a beginner but you make sewing seem so simple. This is fabulous Lauren. I love you colours – very subtle. I have left a comment on your blog too. 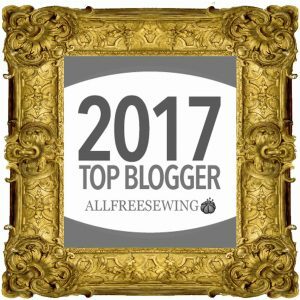 Could I feature your make on my newsletter? I will link back to your blog of course! Where can I find the patterns to download in letter size? I live in Canada and don’t have the A4. How much of each fabric should I purchase for this? I see the free pattern is no longer available, where can we purchase it? HI Lisa – I’ve emailed you. I, too, was so disappointed to find this was no longer available. It is definitely worth paying for and I am happy to do so. Can you help? Thank you so much! Can I buy this pattern? It’s perfect and just what I have been searching for in what seems like forever. Hi Doris, I am just working on scaling it for all sizes at the moment. It should be available in about a month I am hoping. do pattern in US Plus Womens size. I’m a bilateral amputee and due to other ills stay in BIG Tshirts most the time. Your dress is exactly like I need and was quite dismayed that unable to get the Free pattern. As I’m on disability here but want this as looks so easy for my 11 year old gran. She sews for me!!! And is doing a great job….Thanks so much!!!!! Hi I was wondering if I can get this pattern from anyone who has already downloaded it or if there is another link I can use to purchase the pattern for myself, thanks. Hi, please help me, somehow, I can’t buy you pattern. After giving my name and adress, and clicking on the Paypal button, there are no informations on the page to pay you. Would you please give me your IBAN, I can manage to pay you directly. 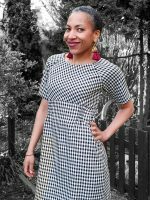 Since I live in France (and i’m very impatient to sew your dress), the best for me would be a pdf ! via email. Hi Jeanne, I’m sorry you were having problems with Paypal. I have changed it now and it should work fine. Please try again. I can email you a PDF in the morning once payment has gone though. Please let me know, if you prefer it formatted for A4 paper, American Letter paper or a single sheet for large format printer? PS. I have changed the format so you do not need to enter your name and address. I will just use the one supplied by Paypal. How do I go about purchasing this pattern? Hi Bonnie, the link is here. You can pay through Paypal. Back in January, you so nicely emailed me, free of charge, the PDF download of this pattern, which I absolutely LOVE. I haven’t made it yet, but was browsing your website and noticed it is now available for purchase as a paper pattern. YAY!! I just bought it! Chances of it being made are so much greater if I don’t have to tape (just me being lazy.) Cannot thank you enough for being so kind as to email me the PDF free of charge and cannot wait to get my paper pattern. That’s great Michele. You’re right, its a pain in the bum taping them together, and the resizing can be tricky too if you’re not sure what you’re doing. Lots of people said the same which is why I brought out the paper version. Not sure where you are based but it’s a bank holiday here today so it will be in the post tomorrow. Make sure you send me a pic when it’s done! I can’t seem to find where to order this pattern. Could you please help me out? The link is at the bottom of the blog post – perhaps I need to make it clearer.